After that he poureth water into a bason, and began to wash the disciples’ feet, and to wipe them with the towel wherewith he was girded. For I have given you an example, that ye should do as I have done to you (Jn 13:1-15). The day before the Passover, Jesus washed the feet of his disciples, and Christians have spoken of washing one another’s feet ever since. Jesus did it as an act of humility. The disciples were to do it as an exercise in love and mutual subjection. We don’t do it much now, mainly because we wear shoes and socks and take a daily shower. Christian feet tend to be a lot cleaner in this decontaminated age than they were in dusty Israel in AD33. But our souls are just as sullied. Perhaps not a law, but certainly a new tradition, if that isn’t too oxymoronic, to induce a little humility; dispel perpetual feelings of superiority; test doctrinal infallibility and confront our pride. After all, we do still need to wash our feet, some more than others. And we all need to eat, but the bread and the wine are privileges. Only if we are humble, forgiving and reconciled one to another may we dine with Him. Only when everything else fades into oblivion can we feed on Him. But it never does, does it? Life is messy, you see. We intone the liturgy and pray the Lord’s Prayer – ‘Forgive us our trespasses as we forgive those who trespass against us‘. But we have not forgiven because the grievance still eats into our soul. There is bitterness, resentment, malice, even hatred. And yet we presume to eat the bread and drink the wine. Funny, isn’t it, how zealous and assiduous we are in demanding the excommunication of our brothers and sisters for their notorious sexual sin, while we take the bread and drink the cup with hearts of hate, hostility, greed and malevolence. If we are to feed on Him, we must be humble and love one another. It is the fruit of the Spirit by which we might be seen and made known to the world: ‘..love one another; as I have loved you..’. If God can empty Himself to become man, then we can empty ourselves of self and fulfil the human vocation to be in the image of God. To be is to live; to live is to breathe, to persist, to remain in Him. And that doesn’t connote always being kind, nice, liked or acting the amiable doormat: loving one another can be a prickly, argumentative and disapproving process. But it is never proud, conceited, ostentatious, haughty, sadistic or spiteful. 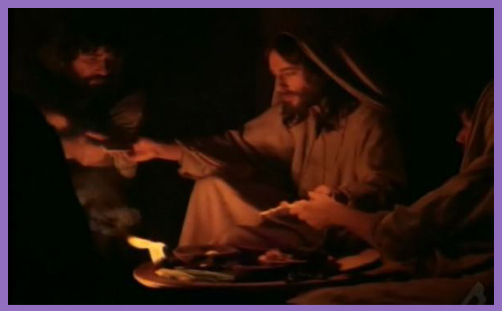 Nor can it be unforgiving if we are to truly live, pray and worship with one another as one body, as He agonisingly entreated in Gethsemane that we should.